Choutari is now in the hands of a brilliant new group of NELTA scholars, and I am excited about that. The old and new teams who were working together for a while in order to make this conversation under the shade of this forum even better had to go through a somewhat difficult time during the month of January—it’s a story that may be worth telling someday, perhaps years from now, and it’s a good one—but we also had a wonderful opportunity to further realize the tremendous value of promoting professional conversation in this great community. With the talent and enthusiasm of the new team, I am sure that we are going to see in the years to come great strides in the work of welcoming, encouraging, urging, prodding us to give back in the form of ideas and inspiration to our society. This work of building our scholarship from the ground up is extremely important to us as educators in a struggling nation right now and it will be, for different reasons, for generations to come. Among the reasons we started this blog, one was to make our professional conversations serve as useful resource by making them open and accessible. And that’s what I want to write about in this reflection today. Since I promised the editor of this month, my friend Bal Ram Adhikari, that I would contribute an entry for the issue, I’ve been trying to write about something that has kept me professionally “awake,” so to say, since I started teaching in a primary school in Butwal almost 20 years ago, something that I continued to ask for the next 12 years in grade schools and eventually at TU and then when I decided to switch from English to Writing Studies. And that something is a whole range of questions, which used to often discourage me while I taught at home: Why am I teaching what I am teaching? Does teaching grammar help students learn language? Why are we asking students to speak in English only? The teaching of literature seems to contribute to students’ personal development quite a bit, but how far does it contribute to their social and professional lives and the society at large? Why do we do little more than giving lecture in the name of “covering” the content of the course and helping students prepare for the exam—and what if there are better ways to achieve these same goals and also make education more worthwhile? What do we mean by “English education”? When we started Choutari, I was happy because this platform allowed us to ask questions like the above as part of a broader professional conversation among hundreds of other scholars and teachers who may have similar questions, different perspectives, better answers. In this post, I want to build on a recent conversation that took place (and at the time of this writing is still ongoing) inside NELTA’s Yahoo mailing list that many of us are subscribed to. I responded briefly there, as it fit that medium, and I want to explore the issue further here, from broader educational, professional, and social perspectives. I request you, dear colleagues, to share your thoughts in the comments section below. 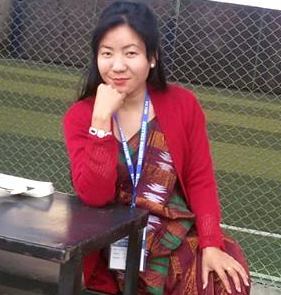 A fellow NELTA member, Umesh Shrestha, asked in the mailing list recently whether we, as English teachers, should communicate in English beyond the classroom and school (because, the writer seemed to imply, we don’t practice what we preach). This was a very thought-provoking question (and among other colleagues, Suman Laudari has responded with some great ideas on the list). Let me get into the relaxing mood of choutari and share some thoughts—for the beauty and fresh air of early spring is returning to the hillsides and I am truly excited by the arrival of a whole group of gaunles under the shady tree. The question of whether we, even teachers of English, should speak English everywhere, as well as require our students to do so in school and encourage to do so outside is not new. And I happen to have strong views not only about whether even our students (forget about us) must be required to speak English at all times in school (if not beyond it!) but also about whether we should use English as a medium of instruction and for what purposes, if at all. Let me take a step back and ask a more basic question: “Why” is it that English is the increasingly dominant, increasingly popular, increasingly unquestioned medium of instruction in Nepal? Is there a straightforward “ELT” answer to this question? Does the use of English as “the” medium of instruction raise the standard of our education overall? Does it make classroom teaching and classroom learning more effective? First, if the answer to questions like the above is more of a “no” than “yes,” then should we make it our professional lives’ priority to make the answer “yes”? Or, should we instead pause and think why the answer is “no”? That is, if using English rather than Nepali and/or other languages of instruction—at least in certain subjects, grade levels, regions, etc—does not have an “ELT” answer (which I presume it doesn’t), then why are we insisting that “English Only” must be the medium of instruction? If imposing English as the only medium of instruction does not raise the standard of our students’ education, then how have we come to embrace the delusion (sorry, but that’s what I think it largely is) that English “is” education (as in the phrase “English education”)? Is there, in the world of reality, such a thing as “English” education (one that is of a different order of intellectual significance than education acquired “in”? another language? )– or have we just created a feel good phrase to describe “English language education/learning” by dropping the key word in the middle? To stay on the yes/no questions above, I would readily say NO, there is absolutely no doubt that IF requiring only English as the medium of instruction, communication, and jus being in school had ZERO SIDE EFFECTS, then the benefits are so many, so significant, so long term, so attractive… that we wouldn’t need to have this conversation. I would whole-heartedly support the use of English as the “only” medium in/throughout school. I’m not joking about this, but IF our students were to come out of high school speaking fluent English while ALSO writing effectively (whether that’s in English or not, please note), demonstrating critical thinking skills at par with their peers in other nations, being able to pursue and generate new ideas on their own, excelling in math and science and technology, etc, and IF the “medium” of English was a significant reason for our students’ elevated standards in all the above areas, then NO we would not have this conversation either. We would just call the adoption of English as the “only” medium of instruction as a straightforward, non-political, purely pedagogical decision. But that’s not the case. We know for fact—and we have been in denial for a few decades now—that the English medium that we have imposed in the name of improving the “quality” of education has VISIBLY affected the effectiveness of just too many teachers’ teaching, thereby their students’ learning, the teaching and learning of math and science and social studies and economics and environmental studies and agriculture and you name it. The English medium is certainly justified for teaching the English language—although even in this case, I have a hard time understanding why we teach it for 12-16 years and our students’ English is not as good as the Nepali proficiency of my Christian missionary friend who has been in Nepal for less than a year. Yes, our students’ English proficiency—and indeed our own as English teachers—may be too low. And it is for us as teachers (plus scholars) to develop solutions by having serious curricular, pedagogical, and educational discussions. But our good intentions to solve a problem don’t justify just “any” means. For instance, it would be terribly absurd for us as English teachers to tell our colleagues teaching social studies and math and physics and chemistry and their students who are solving algebra problems or playing khopi or eating samosa in the canteen that they must use English because— oh, wait, I forgot what I was about to say! English, you know, English, and like English education. Like globalized world. Opportunities. The internet. Facebook…. Okay, I can’t think anymore. Let me do something different. Let me tell you a story. I have a nonnative English speaking (Chinese) student named Bao in my “intermediate college writing” class (here at the State University of New York). During the first class meeting in a one month long intensive writing workshop, while I was describing one of the assignments, a “rhetorical analysis” of a text that students would choose, Bao raised his hand, with his face looking like he was terrified of something, and said: “Professor, I don’t have the ‘professionalism’ to criticize the author’s writing style….” Bao’s English language “speaking” proficiency was so low that I couldn’t help thinking how many of the international students (15 out of 20, from 6 different countries, with different extents of exposure to “native” English speaking communities) were going to pass. Bao’s case was particularly striking: he not only struggled to express himself in English, as a student who had just come from a sociocultural background that doesn’t value “challenging” or even “analyzing” the ideas and expressions of established writers and scholars, he was saying that he neither could nor would like to “criticize” how a scholarly article was written. I gave a short answer and invited Bao to my office for further discussion. During the first discussion I realized that Bao was “confusing” his low proficiency in English with his lack of “knowledge” about what “rhetorical analysis” means; so I gave him a text (an excerpt from Martin Luther King’s “I Have a Dream” speech), a sample rhetorical analysis that he and I found online, and a long list of questions with which I broke down the assignment (as supplement to the assignment description). Long story short, the rhetorical analysis that Bao wrote within the first week of class (before the class moved to another project) was in many ways better than the writing of most other students in class, including the native English speaking students (some of whom, by the way, implemented what they had already learned in high school and turned in their papers, and their papers showed little new learning). One of the things that Bao had done was to copy, adapt, and echo the rhetorical analysis “moves” made by other writers in the many samples that he had gone on to find: he deliberately avoided looking at rhetorical analyses of the text he was analyzing so he was not plagiarizing. When he submitted the finalized analysis, I had to start by asking whether and to what extent someone else had helped him write the paper and/or he had copied from another writer’s analysis of the same text. He had not, as I found out that he had done what I just described. So, it was not because Bao mastered the “medium” (indeed, it was “in spite of” the medium that still lagged significantly) but because he was engaged with ideas (a highly thought-provoking text), because he had an unyielding commitment, because he learned how to learn, because of his commitment and motivation that Bao was able to do what seemed so impossible. Even as he imitated and echoed and adapted and ventriloquized sentence structures and phrases and worlds from the samples that he gathered from all kinds of sources, Bao learned a whole new “discourse,” indeed a new language, in his incredible one-week long learning journey, thereby tremendously improving his overall English language skills (including skills for critical thinking, analytical reading, and composition). When I read Bao’s final draft, I questioned some of the conventional teaching wisdom that only rare situations like this make me ask, only situations like this can so beautifully blow up in the air. Reading the question about how great it might be if we too were speaking English all the time, I was almost depressed to think about the state of our education—I mean about the learning part, the part where the nature and content of education matters, the part where our students are being prepared (or not) to become intellectually and professional capable of navigating (and indeed competing in) the complex, connected, global world that they live in and need to be even better prepared for. Let us (of course) develop practical solutions for practical problems. But let us do so without being so naive as to think that we can be more effective at doing so by eschewing the larger context of education–motivation, rationale, fairness, etc–in the name of being practical. Let us not allow the politics of denial (or the claim that one is not being political in order to stay above the discussion when the issue is politically significant) to justify an active forgetting and overlooking of the larger purpose of teaching English, or social studies or science for that matter. It is only within the larger social context that our problem-solving of any ELT issues—the questions we ask, the answers we seek—will make sense. And to connect that to what I was saying about the importance of joining and promoting such conversations like this in choutaris like this, I have the same old, humble request for you. Dear colleague, after you read a post, or two, maybe all, please do not forget to add a line, or two, or many lines, sharing your idea, experience, feedback… as encouragement to the writers and good example for other readers. 1. First, we all agree that we should teach and learn English. Learning as many languages as possible is always good for social and cognitive reasons. However, when we talk about the role of language in education (e.g., English language teaching, Nepali language teaching, first language/mother tongue teaching), as the studies have shown that we should not ignore children’s own linguistic, social and cultural capital/resources which can always be helpful to begin teaching and provide important insights to teachers to scaffold conversations in which students are engaged to learn ‘a language’ (here English for example). As Bhawana-ji have rightly mentioned, by profession, I should speak English; and as Umes-ji have pointed, we have to teach writing, reading, listening and speaking (I have put this skills in the same order teach in Nepal with regard to ELT). I absolutely agree with your views. We have our professional identity, an English teacher. At the same time, as Shyam and Suman-ji have indicated that language teaching (any language) is ideological, contextual and socio-cultural in which on-the-ground realities are important to consider. A large number of studies on EFL/heritage language (not ESL) contexts show that we can help students improve their foreign language skills if their own existing ‘linguistic repertoires’ are taken as an important resource for teaching. For example, most children in Nepal are bilingual (and some are multilingual) may code-switch/mix Nepali (or other languages, e.g., Tamang in Rasuwa where children are very poor even in Nepali) while communicating in English. Of course, we teachers do not entertain this tendency of students largely because the whole discourse or tradition of language teaching (all language teaching ..mother tongue, Nepali and English in Nepal, for example) up until now is dominated by ‘monologt’ or ‘monolingual’ ideology. I personally believe that if we are able to create a flexible pedagogical environment in which students can freely communicate in the classroom by building on their ‘bilingual or multilingual repertoires’, students may feel comfortable to achieve target language repertoire (English, for example). 2. Second, and most importantly, we, as language teachers, should be aware of the fact that we have a key role to interpret, negotiate and appropriate language policy. Thank you Umes-ji for raising critical questions in the NELTA Lalitpur conference. As you know, upon Dinesh-ji’s request, I had also shared preliminary findings of my research in this group. I was eager to know about what the panelists argued. After reading your email, I learned that all panelists justified the ‘government’s move’ to introduce English as medium of instruction (MOI) from Grade 1 in public schools. As I was not present in the conference, I do not know what the panelists representing NELTA said. But I wonder whether it was NELTA’s institutional stance or their own individual potion to take the English MOI policy as a granted. I do not like to use ‘linguistic imperialist’ metaphor here to discuss role of English in Nepal because the notion of ‘imperialism’ is a relative concept. For example, Nepali is imperial in Nepal, Hindu may be imperial in Terai and so on. Imperialism is another issue. However, we lack an integrated and critical discussions on language policy in Nepal. Two critical issues in this regard are: a) ELT in Nepal has never been considered as part of language policy issue which requires planned and on-the-ground research base for its effective implementations. The disastrous results (as all of you have discussed already) stems not only from ineffective classroom pedagogy but also and largely from ineffective planning including lack of clarity on when and why should we teach English. For example, I have seen that on the one hand, the Ministry of Education has made a policy to teach children in their mother tongues until Grade 3 (you can see their multilingual education policy), but on the other hand they are promoting English from Grade 1. The worst thing is we teachers, and students are never consulted nor are engaged in policy creation and implementation process. 3. So far as the issue of “demand” is concerned, YES English has global demand. As I mentioned already we should teach English because it is part of our education system. But where does this demand come from. As Umes-ji has mentioned, during the NELTA Lalitpur conference the panelists agreed that English as MOI should be taught from Grade 1 because parents and children ‘demand’ that. But I am not sure whether they have any empirical evidence to justify that. Drilling into this issue, we should also look into the on-the-ground realities. It’s not because teachers are not incompetent, but because children are not able to use a foreign language (English in our case), from the first day in schooling and we impose our ‘monolingual’ view over them, children do not feel comfortable to speak English … they are scared of making mistakes, most of time. 4. We have also underestimated the classroom ecology while making ELT policies. Even though policies are made they are translated into practice. It’s not teachers fault. What can they do with limited resources and lack of training? Teacher are in an ambivalent position as all of you have mentioned already. How a bilingual/multilingual student learn a new language (English for example) in multilingual country like in Nepal is not studied well in the field of Applied Linguistics and ELT. That’s the reason we, EFL teachers in the periphery, are not finding the ways to solve our own issues. Consequently, we have to think from monolingual perspective, which does not solve problems in multilingual contexts, to teach any language, not only English. I am also sharing Dr. Ram Ashish Giri’s article “Cultural anarchism: the consequences of privileging languages in Nepal” and Professor Alan Davies’s article “Professional advice vs. political imperatives”. I hope you find these articles useful. I apologize if there are any typos in this email (written in haste). Thank you Umes-ji for starting a wonderful academic discussion, which I always wish and enjoy, in neltamail. I would like to extent my thank to the team for reasing such issues which has become the platform of depth diagnosis of the current ambiguities and complexities we language teachers are facing in the country. Supporting the concept, i hve been impressed to write with the statement as prem sir has shared us. in his words, he personally believes that if we are able to create a flexible pedagogical environment in which students can freely communicate in the classroom by building on their ‘bilingual or multilingual repertoires’, students may feel comfortable to achieve target language repertoire (English, for example). Furhermore, the language teachers of the rural areas who are in the public campuses have become just theorist and they are not able to apply the techniques to make the rural students communicate in english even in english class due to the unmanaged systems and escaping away from the challenges in some tachers. in my case, while i teach to the students of bachelo level in public campus, i just notice their behaviour whether they are enjoying or feeling irritated. Though thay come from weak ground and they are forced to choose english subject and stuggle during study.But i should say that those who stuggle and try to learn becomes the good communicators as a late commer but most of them are even do not seem like students and they are really willing to learn something after coming to tha college. We public campus teachers have the challenge to deal with the ELT learners in distinguished public campuses scattered.